Welcome to About the test, where we will give you all the explanations you are looking for and if you are still unsure as to how you are required to proceed please do not hesitate to contact us at mail@salearners.co.za. 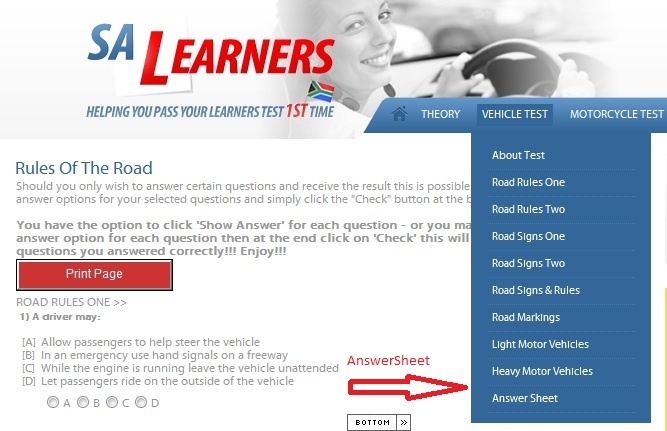 This website is designed to provide you the learner with the most comfortable learning environment in which to learn and prepare for your learners licence test. Firstly the way we have designed the website is to give you the most flexibility while answering the questions.. 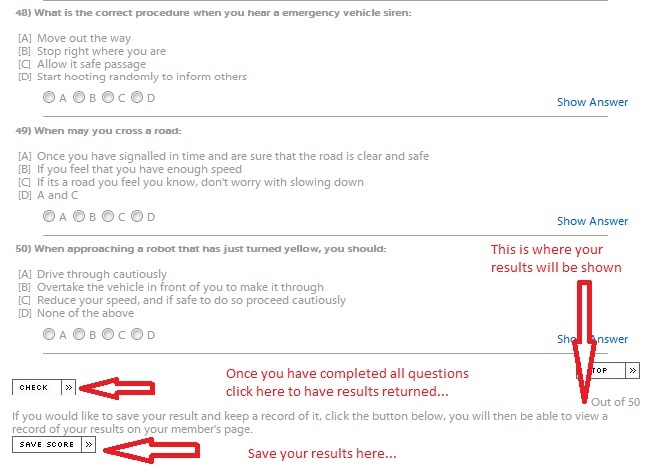 Lets take you through the process step by step, if you are for instance preparing for your motor vehicle test, you would click on the link titled "Vehicle Test"
You will notice a number of links below it. Each of these sections need to be completed, you may select which ever one you would like to start with first, it is advised to start with "Rules of the Road" first and then work your way down the list in the order that it is presented. Each option on the menu represents a test sheet, except "Road Markings"you just need to study these pictures and what they mean. So you have decided to start with "Rules of the Road". 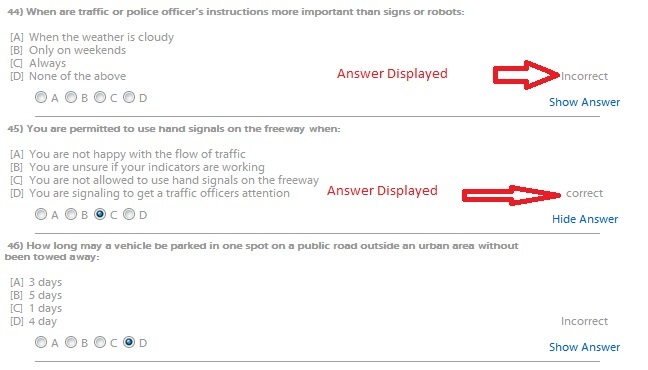 You will notice that the test questions are in multiple choice format, now you will want to start with the first question then work your way down to the last, click the answer option you feel is the best option as an answer and then move on to the next question, as you do this your choice of answer is recorded. When you get to the end of the questions you will click on the "Check" button and it will return a result to you, so for instance if you got 40 correct answers then the result displayed will be 40 out of 50. The result is displayed at the bottom of the page where the "Check" button is situated. If you wish to save your score click the "Save" button and your results will be saved to the database. You will be able to view your results on your members page. Now you will also be able to see which questions you got correct and which were incorrect by returning to each question either "Correct" or "Incorrect" will be displayed under each question..
or you may select another option so if you first choose say "A" and you got the "Incorrect" result you could try again with maybe "B" then return to the "Check" button at the bottom of the page and click the "Check" button, once that is done then you return to the question and it will then once again tell you if you got it "Correct" or "Incorrect" you may do this as many times as you wish with as many questions as you wish. So say you would like to only answer the first ten or last five or the middle 8 questions there is no problem there choose the answers you would like then go to the bottom of the page click on the "Check" button, it will return your result. However it will return a result out of what ever the total is, so say you answered 10 questions then your result is actually out of ten and not out of what ever the total amount that is stipulated is. . .You can always double check this by seeing which questions have a "Correct" or "Incorrect" result.